While most beautiful things tend to also be high-maintenance, orchid trees are a notable exception. Once they are established, orchid trees (Bauhinia spp.) become low-maintenance ornamental additions to the landscape. 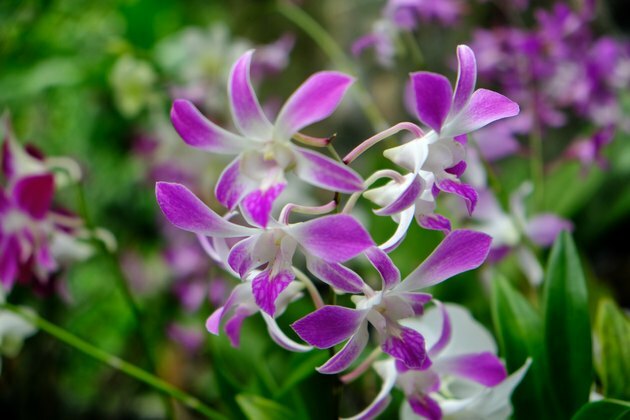 Give them reasonably well drained soil in a moderate climate and orchid trees will typically grow quickly and thrive. They prefer to grow in sheltered areas to reduce cold and wind-chill and offer a show of open-throated blooms in return for modest care. Also called ebony trees, orchid trees grow in U.S. Department of Agriculture plant hardiness zones 9 to 11. Learning how to best care for orchid trees can help you keep yours thriving for many years to come. Notable for their showy bloom clusters and two-lobed leaves, orchid trees produce sweet-smelling flowers in white and shades of pink, lavender, purple and magenta. The tree tends to be attractive year-round as it begins blooming slightly before or after losing its leaves. The Hong Kong orchid tree (Bauhinia blakeana), USDA zones 9b to 11, is evergreen and produces magenta flower clusters. This species is less winter hardy than most of the other orchid trees and may be badly damaged by frost and freezes. All species create debris from falling petals, and the deciduous trees drop leaves. Keep in mind that parts of some orchid tree species are poisonous. Orchid trees are generally not fans of extreme climates. All varieties of orchid tree do best when protected from temperature extremes. The tree grows fairly fast, prefers mildly acidic, well-drained, loam, sandy or clay soil. It thrives in a soil pH 5.5 to 6.5 and prefers full sun or intermittent shade. The tree is drought-tolerant once established, and its need for water can usually be met with seasonal rains. Water periodically during dry periods, but remember that even too much of a good thing can be problematic, so avoid over-watering. Every living thing benefits from a healthy diet and your orchid tree is no exception. Feed your orchid tree general landscape fertilizer in March and June for its first three years, Penn State advises. For example, mix 1 tablespoon of water-soluble fertilizer in 1 gallon of water in a watering can. Alkaline soil can cause yellowing foliage. Apply a fertilizer that contains chelated iron fertilizer to correct this. A common fertilizer for blooming plants containing chelated iron has the same mixing instructions as the general fertilizer, or follow the manufacturer's instructions. This fuss-free tree doesn't tend to attract pests, although caterpillars may feed on it. If caterpillars cause more holes in the foliage than you can stand, a product containing Bacillus thuringiensis offers an ecofriendly method of control. Use a spray version and apply it where needed. While maintenance levels for your orchid tree are relatively low in comparison to other trees, it could use some help with achieving an ideal shape. For optimum shape and branch strength, the orchid tree requires pruning. Sterilize pruning tools before and after use with a solution of 1 part household bleach to 9 parts water and allow to air-dry. Prune after the blooms are spent. The tree tends to grow more than one trunk, but you can shape it to have a single trunk by using sterilized loppers to remove the undesired additional trunks. Alternatively, keep three trunks. Prune off low branches to create a higher canopy for a pleasing shape and clearance. Its branches tend to curve down from their own weight and sometimes break. Pruning the branches after each blooming season reduces this tendency.